Why are some nations rich and other nations poor? What has enabled some nations to escape poverty while others continue to languish? And if we want to help poor nations prosper, what’s the right recipe? Since I’m a public finance economist, I’m tempted to say a flat tax and small government are an elixir for prosperity, but those policies are just one piece of a bigger puzzle. A country also needs sensible monetary policy, open trade, modest regulation, and rule of law. In other words, you need small government AND free markets. But even that doesn’t really tell us what causes growth. In the past, I’ve highlighted the importance of capital formation and shared a remarkable chart showing how workers earn more when the capital stock is larger (which is why we should avoid punitive double taxation of income that is saved and invested). But that also doesn’t really answer the question. After all, if a larger capital stock was all that mattered, doesn’t that imply that we could get prosperity if government simply mandated more saving and investing? There’s something else that’s necessary. Something perhaps intangible, but critically important. Deirdre McCloskey, in a video for Learn Liberty, says that ideas and innovation drive growth. This is a great video for many reasons, but two points strike me as very important. First, Deirdre is saying that economic liberty matters, but that modern prosperity also was enabled by a change in the culture. People began to appreciate and respect entrepreneurs. You could call this a form of social capital (and I think such cultural norms are critically important for a thriving society). And entrepreneurs are the innovators who figure out ways of mixing capital and labor in ways that generate ever-larger amounts of economic output, so they play a critical role in boosting prosperity. Second, she reminds us that poverty is the normal human condition and that the modern era truly is an amazing change. Indeed, I was so shocked by her numbers that I had to investigate to see if she was exaggerating. She wasn’t. Using the Angus Maddison data set, I looked to see if Deirdre was right about world prosperity resembling a hockey stick. 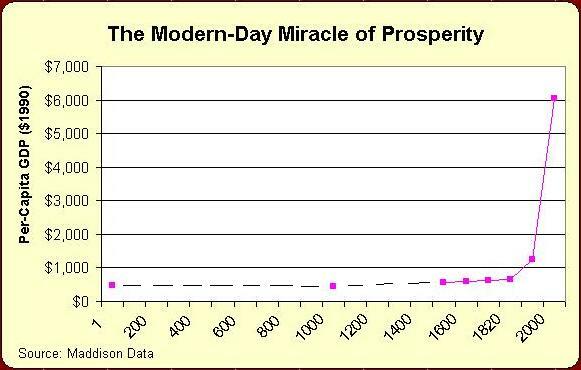 Sure enough, there was an amazing increase in prosperity beginning about 1800, just as she explained. Indeed, she could have said that people lived on less than $2 per day for much of recorded history. Here’s the data for world per-capita economic output over the past two thousand years. Wow. Unlike the make-believe hockey stick used by global warming alarmists, this one is real. And it shows that the economy definitely isn’t a fixed pie if the right policies – and the right attitudes – prevail. Perhaps the most obvious lesson is that we should respect and appreciate entrepreneurs and other wealth creators. Unfortunately, we live in an era where politicians would like us to believe that the economic pie is fixed and that it’s the job of government to re-slice the pie with class-warfare tax policy and lots of redistribution. But when they re-slice the pie, they also change the size of the pie. And not in a good way.